This weekend I was stripped naked, poked, pulled and prodded into submission. No I didn’t spend a night in the slammer, I went to King Sauna, a Korean day spa, for a body scrub and a “relaxing” massage. My mom told me it would feel like heaven, but if that’s heaven, I’m scared what hell would be like. At one point, the massage involved my hair getting repeatedly pulled. But to be fair, my skin now feels incredibly soft and all the dry skin that had been building up on my body during the cold winter months is gone. My boyfriend says I’ve been tenderized. In addition, all the different hot tubs and saunas were pretty cool. I especially liked the cold Ice Room and walking over the hot stones in the Herbal Steam Sauna. King Sauna has a real restaurant with an extensive menu, but after spending three hours at the spa, my mom and I decided to grab a snack from the juice bar and go home for dinner. Upon my friend Ellie’s recommendation, we got the Roasted Eggs (eggs roasted in their shells over hot stones, $2 for 3 eggs). 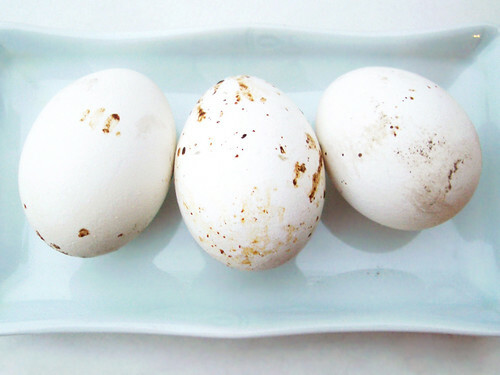 The gorgeous eggs, spotted from the hot stones, looked like gigantic quail eggs. 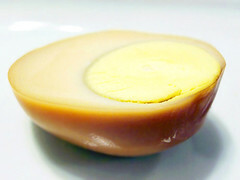 Inside, the whites were cooked a rich shade of brown and were more firm to the bite than a regular hard-boiled egg. Taste-wise, they were slightly nuttier from the roasting, but alone were a bit bland. This was remedied by dipping the eggs in a little soy sauce that was on the table from the sushi we were eating for dinner that night. A little salt mixed with toasted sesame seeds would have worked as well. I’ll have a full report of the food options at King Sauna in the coming months. Next time, I think I’ll skip the scrub and massage, and just go for the sauna and the food. I like relaxing at my own pace, and it turns out heaven is not for me. What a fun adventure! I would love to try the eggs, I wonder how long they roast them on the stones? @Heidi – I was wondering that myself. My guess is 2-3 hours, but I’ll find out the next time I go. Update coming soon!